When did you last go to Cleveleys? Posted on June 9, 2014 | Comments Off on When did you last go to Cleveleys? I’ve not been to Cleveleys since I was I was seven. Sixty years later I had this illogical urge to eat fish and chips on the sea front. On a cold sunny morning I arrived on the promenade. It is new, all of it! Part of an improved sea defence scheme to prevent the town being flooded. 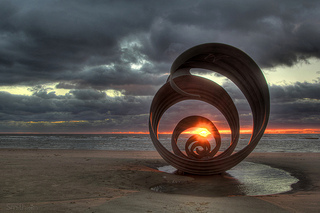 It is magnificent; not just a pile of concrete but an art inspired design called The Wave. It literally flows along the sea shore and you can imagine in a storm how the water will swirl and be channeled back into the sea. Search for seashells and you will find Mary’s Shell standing on the shore. 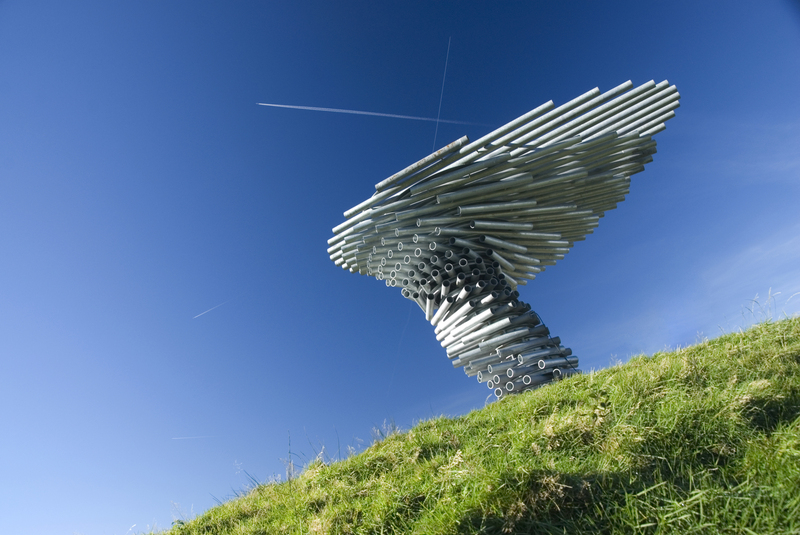 It’s a four metre high sculpture designed by Stephen Broadbent. Children were climbing on it, sliding down it , hiding within it and dancing around it. 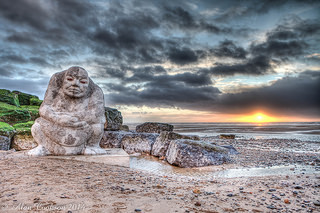 On the same sandy beach they raced over to touch the Sea Ogre standing in silvery sea foam: 12 tonnes of polished and unpolished limestone carved by Adrian Wright. And what else? Explore the Sea Swallows – aluminium beacons standing high above the promenade or our dear friend John Merrill’s nine metre long wooden Paddle. You will remember John, who has worked closely with Mid Pennine Arts, for his White Lightning on the Padiham Greenway. The inspirational thread for this artwork is an illustrated children’s story: The Sea Swallow by Gareth Thompson, illustrated by Hannah Megee. I remember poring over a copy brought into the Office by Steph Hawke. It had originated in the Lancaster Literature Festival. It too is worth a look. And the fish and chips? ….try ‘Kay’s Fish and Chips’ just opposite the promenade. Comments Off on When did you last go to Cleveleys? Since October last year, young people in Billington and Nelson have been exploring the story of the Pendle Witches. Some of them have decided to work towards their Bronze Arts Awards as part of the project. 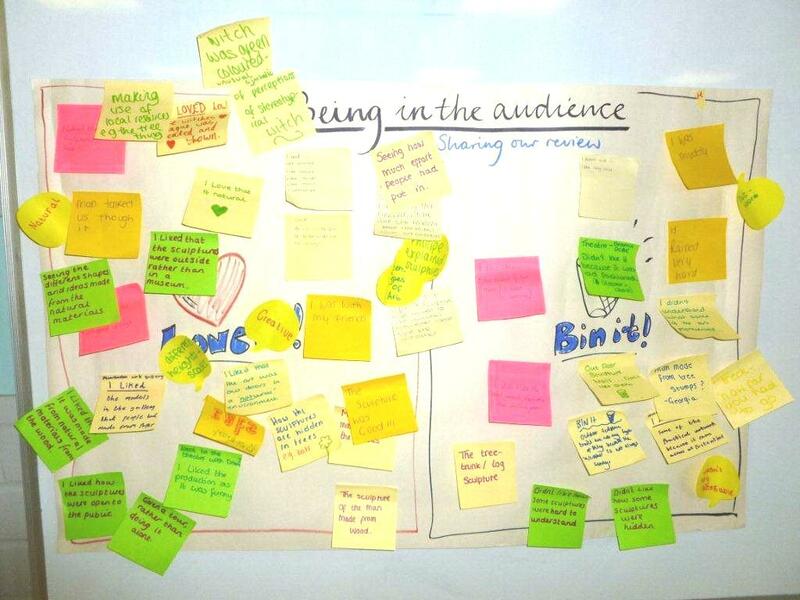 Below are Hakeem, Ikram and Caitlin’s reviews of ‘being in the audience’. Hakeem and Ikram visited Pendle Sculpture Trail with artist Philippe Handford, whilst Caitlin missed the visit so chose to review her experience of Bingley Music Festival. 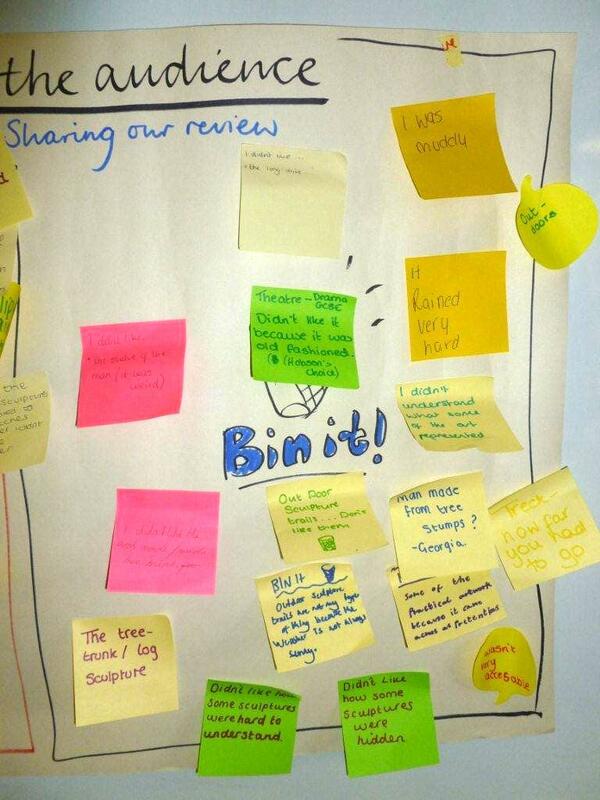 Please comment on their reviews, this will provide them with evidence for their Arts Award portfolios. We were in a forest full of sculptures. There were sheep and it was raining. It was called Pendle Sculpture Trail. We were in a project called Pendle Witches. (The things I liked and why): meeting one of the artists Philippe Handford, because I wanted to know what inspired him. (I didn’t like) the weather because we were getting wet. I would recommend it to others because the art was great. (I learnt) how the witches were a part of the art. (Visiting Pendle Sculpture Trail) was a great experience of old sculpture. (I went) to experience seeing natural sculptures. (I liked) that it was open space, outdoors. (I didn’t like) the weather. I would (recommend it to others) because it is a great place to investigate our country’s past. (I learnt) that natural art is beautiful. The event was a music festival and lots of musicians performed. I went to this event because I’ve always wanted to go and I finally got the opportunity. I liked watching my favourite musicians perform, like Nero and Rudimental because I’ve always wanted to see them. I didn’t like the weather, it was cold and muddy. Also it’s really busy and I got lost. I would recommend it because it’s like one giant party and you meet lots of new people, also you have a feeling of independence. I learnt how to take care of myself and how great live music is! (As evidence of being in the audience) I have my ticket, a photo and ruined shoes! Contemporary Heritage Launch Events Defy the Weather! Posted on March 26, 2013 | Comments Off on Contemporary Heritage Launch Events Defy the Weather! With two launch events on subsequent weekends in March the MPA team, artists and venue staff have been working flat out to have everything ready on time. All was planned down to the last detail including preparations for rainy spring weather. What we got was two weekends of bitterly cold winter weather including serious snowstorms for the second opening. Despite this everything went ahead, with the addition of extra layers, hats, scarves and gloves! Turton Tower is a wonderful gem of a venue that is a delight to explore. Owl Project‘s installation there is in the library and the gardens. As the rooms are rather small we thought we’d have a marquee in the beautiful gardens for refreshments, speeches etc, not realising just how cold it would be. Thankfully our guests are a hardy lot and over 80 turned up for the event and enjoyed the hot coffee and cupcakes provided by the team at the Tower’s cafe. We were especially pleased that so many brought their children with them as K-Scope is an ideal contemporary art installation for young people. The wooden analogue computer in the library is interactive, you need to turn the handle to see it come alive, so kids (big and small) loved that and there was a queue for much of the afternoon. As for the listening horns in the gardens, all the guests were fascinated by what they could hear. Was it really the sound of James Kay’s amazing subterranean workshop? MPA’s Creative Director, Nick Hunt, acted as master of ceremonies for the launch and we were delighted to be joined by Steph Murfin, Pennine Lancashire Museums Curator of Applied Arts, who talked about the ‘Wonderful Things’ campaign which is celebrating the amazing, weird and wonderful collections and stories of Pennine Lancashire Museums. The final speaker was Simon Blackmore, one of the three artists, along with Antony Hall and Steve Symons, that make up Owl Project. He explained the research and development that had taken place that had lead to the creation of K-Scope which gave a fascinating insight into the history of Turton Tower. Simon, Antony and Steve spent the rest of the afternoon talking to people about the work and demonstrating how it works, which was much enjoyed by the guests. On Friday 22nd we woke to snow storms, snow drifts and freezing cold weather. After much deliberation of the logistical problems (staff being able to get to Gawthorpe to open it, for example) we decided to go ahead. 120 people had booked to come to the launch and in all honesty we thought less than a quarter would make it, so we were delighted when over 80 people joined us to celebrate the opening of this beautiful and emotive work. Many of the volunteers from the photoshoot, which was integral to the work, joined us and enjoyed trying to spot themselves in the finished installation. Unfortunately the artist, Catherine Bertola, wasn’t able to make the journey from the North East and was very disappointed not to be there. However we were lucky to have some other very special guests who helped us open the work. Nick Hunt acted as MC again and introduced: Bruce Jackson, County Heritage Manager, Lancashire CC; Jane Beardsworth, Regional Director, Arts Council England and Co Cllr John Shedwick, Chairman of Lancashire CC who did the official honours of declaring the installation open. In lieu of Catherine, MPA’s Project Manager for Contemporary Heritage, Lucy Green spoke and thanked all the many volunteers, partners and funders who have made Flicker possible. It was a bitter sweet moment as it was Lucy’s last day with MPA (she’s moving to Contact Theatre, Manchester) and a bit emotional for the rest of the team. We were delighted with the reaction to Flicker and how worthwhile the guests thought their journey through the snow had been. 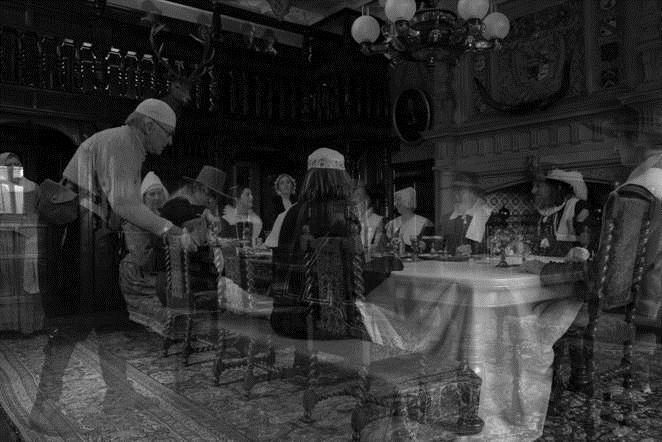 As with K-Scope at Turton Tower many of the guests had not visited the venue before and as well as enjoying the contemporary art had discovered a fascinating heritage venue that they will visit again. The perfect response to a Contemporary Heritage installation. Comments Off on Contemporary Heritage Launch Events Defy the Weather! 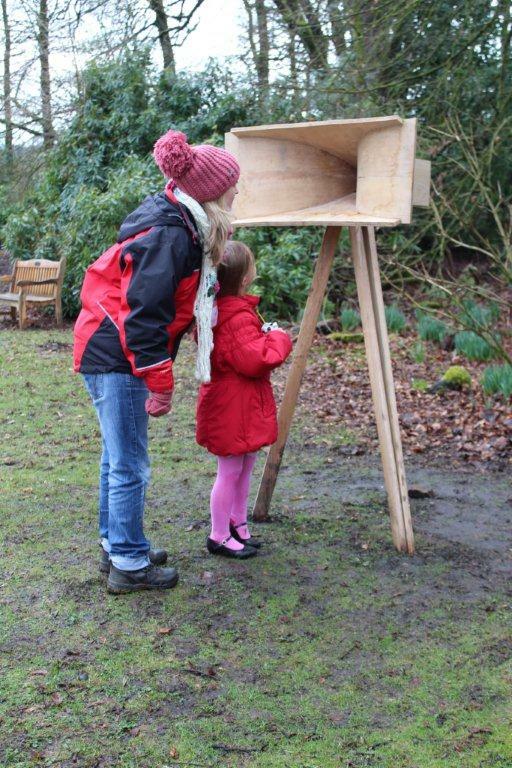 Young people involved in our Lost Legends project have been experiencing art, most recently by exploring a sculpture trail. Here are their more detailed reviews of their experience as arts audience members. To help them achieve their Bronze Arts Awards please leave a comment about their reviews below. The event was a Pendle Sculpture trail at Aitkin Wood. The artform was Sculpture. The pieces were made by a number of local artists, the main artist was Philippe Handford. The art trail displayed was made from natural materials in the wood. I went to this event to gain more information about the Pendle Witches for our project. Some sculptures linked with stories of the Pendle Witches. I liked how the sculpture trail was outside linking with the natural materials the art was made from. 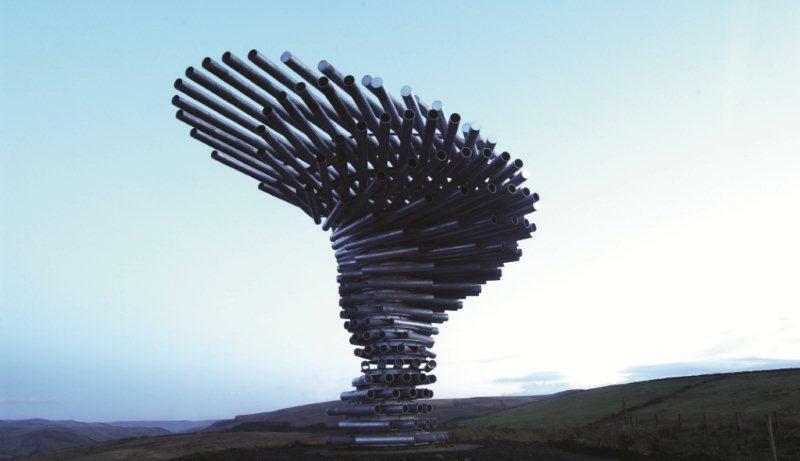 I especially liked the sculptures of the falling tree as something good was made from something useless. I didn’t like how the trail wasn’t very accessible and how some sculptures didn’t relate with our project of the Pendle Witches. I would recommend this sculpture trail to others because the experience is very different as the art work is made naturally and displayed outside. However some people may not prefer this. From this experience I have learnt how art can be made from something as simple as tress. I have learnt that people actually make these outdoor sculpture trails. (I went to) Pendle Sculpture Trail at Aitkin Wood. It was a trail up a hill that included lots of pieces of art made from natural materials. Lots of different artists created them and the main one was Philippe Handford. I am doing a project on the Pendle Witches and wanted to see if the sculptures showed us more about the witches. I liked to see how much effort people had put in, especially in the sculpture of a made made from a tree bark, because of how detailed it was. I also liked how it was made from natural materials. I didn’t think the trail was very accessible and it was hard to understand what some of them meant. I also thought eh sculptures were quite dull and could have been better with colour. I would recommend this trail to others if it was a nice day because the sculptures were very raw and natural. However I don’t think it suits everyone. I learnt that lots of different sculptures and pieces of art can be made from such simple materials that create something with much more meaning than they did in their original form. (The event involved a) talk about the sculpture trail of the Pendle Witches. (I went to this event) to get a better background knowledge of the Pendle Witches). The sculpture trail included many interesting pieces. I particularly like how the bats were hidden in the tress and also the fallen trees. (It was) a little difficult to understand some aspects of the sculpture trail such as the wall. I would (recommend it to others) because it is very interesting and a good day out. (I learnt) how other people interpret their different views of the Pendle Witches into art. We went to Pendle Sculpture Trail which is in Aitkin Wood. We walked around and looked at artwork by Philippe Handford. The theme is the Pendle Witches. (I went to the event) because I was interested in viewing the artwork of Philippe Handford and exploring the sculpture trail. I did not enjoy the sculpture trail because although good, I didn’t see how the artwork was relevant to the witches and it was quite dull. I enjoyed walking and exploring the woods and liked learning about being a sculpturist. The artwork was very complex and was hard to understand the relevance to the Pendle Witches. I learned about Philippe’s work as an artist and that you could make a career out of sculpture work, which I didn’t know before. We walked around a trail and saw different artwork / sculptures. I went to this event to learn more about the Pendle Witches. (I liked) the different sculptures because they were interesting. 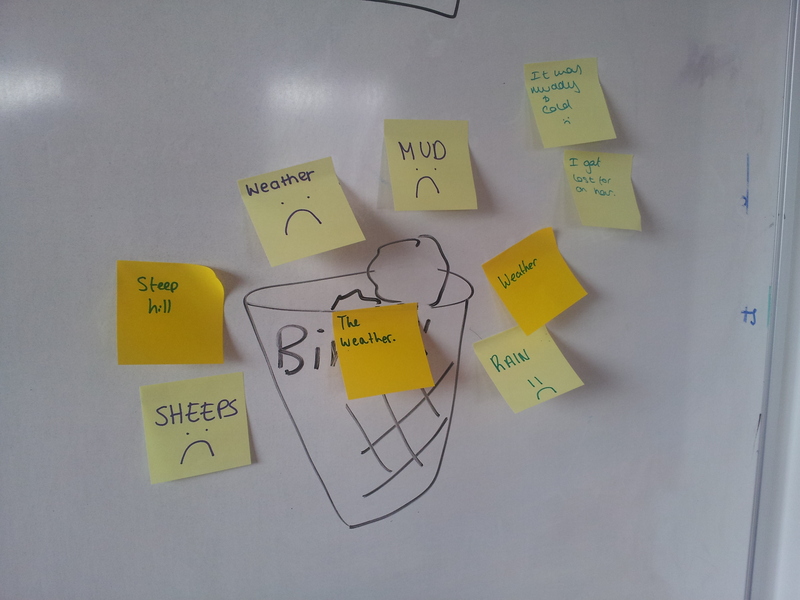 (I didn’t like) the weather (and I felt Philippe) didn’t explain it properly. I would recommend it to others because it was really fun and you can learn a lot. I learned lots about the Pendle Witches. Pendle Sculpture Trail was at Aitkin Wood. Philippe Handford took us around and explained the many art sculptures to us. Many artists were involved in these sculptures. I went to this event because we are doing a ‘Pendle Witches’ project and during this project we wanted to find out more about the stories and how these sculptures showed us more about the witches. I liked the fact that the sculptures were all outdoors because it gave the art a ‘natural’ feel. I also liked many of the sculptures because they were interesting and different. I didn’t like the fact that some of the art was quite hard to understand because it was very different, also it was not very accessible since it was outside. I would recommend it to other because it was very interesting, especially because someone explained it to us and I felt I learnt a lot. I learnt that the different ways we can make sculptures and how the sculptures tie in with Pendle Witches. We went on an art sculpture trail, and walked around the woods of Pendle, looking at naturally made objects made by Philippe Handford. (I went to this event) to learn more about the Pendle Witches and visit the area that all of the things occurred in. There was a range in art things. I liked the sculptures which were made naturally out of resources like trees and metal. (I didn’t like) the weather and atmosphere, also I didn’t understand the explanations behind the sculptures. I would (recommend it to others) because then people in the area could learn more about the Pendle Witches and look at the sculptures. I learned more about the Pendle Witches. I went to see the Lion King, the artform was theatres. I want to watch the Lion King with my family. (I went to this event) because it was a great experience and I liked the film. (I liked) the animals, the acting, the experience (and that) I knew the story. I didn’t like the long drive. I would recommend it to other people because it is a great experience for families to watch. We were viewing sculpture that Philippe Handford had made out of natural materials. We went to the event to learn more about the Pendle Witches. I liked it because I learned about the sculptures and I spent the day with my friends. I could not understand the story behind the artwork (but) I would recommend it to keen walker or people who like history. I learnt more about the Pendle Witches. We walked around Aitken Wood following the Pendle Sculpture Trail. We were given an audio tour from artist Philippe Handford. Its theme was the Pendle Witches. I went to this event because I was very interested to explore the trail. I found it easy to relate to the witches’ story. I liked talking to Philippe and learning about his job and things. Also exploring the artwork and realising how much time went in to making it. I didn’t like the boggy footpath and bad weather. Also I did not like the duration of the tour as it dragged on and got boring. I would recommend it as it was helpful to understand the witches’ story. I learnt more about the witches’ lifestyle and what they did in their life. (I took part in) viewing all of the sculptures that Philippe Handford had made from natural materials. I went to learn more about the Pendle Witches. I liked the creativity and how he made all the sculptures from natural materials. I didn’t like how I couldn’t understand the story behind the artwork. I would recommend this artwork to people who enjoy walking and have an interested in history and art. I learnt more about the Pendle Witches and how different sculptures can be made from natural materials. We went on a sculpture trail at Aitkin Wood. The artist Philippe Handford led us along the trail explaining his artwork. I went to this event because it was linked to the Pendle Witches project we are working on. I was very natural, all the materials were tree-based after being cut down. All the art being at different heights made it interesting. It wasn’t very accessible or easy to walk around in difficult conditions. I couldn’t really see a link to the Pendle Witches. I would recommend it on a nice day because it was a nice walk and the art was quite eye-catching. I learnt that you can make beautiful and inspiring art out of natural materials. We followed a sculpture trail around Aitkin Wood, and the tour guide was Philippe Handford. He was the artist who made the sculptures, and he explained what they meant. We were involved in a Pendle Witch project and we were going to get more information about the Pendle Witches. I liked the fact that the art was at different heights and different sizes. The location linked to the story about Pendle Witches plus it was a very natural feeling because it was outside in the woods. I didn’t understand the art, the tour guide and the art didn’t really link to the Pendle Witches. It didn’t involve much about the witches. I would recommend this to others if it was a nicer day, but we did manage to enjoy it even though the weather was bad, which means it would be more enjoyable in better weather. (I learnt) that art could be portrayed in different ways and that artists could use locally sourced materials to create the sculptures. Also that the artists could be paid for doing this. 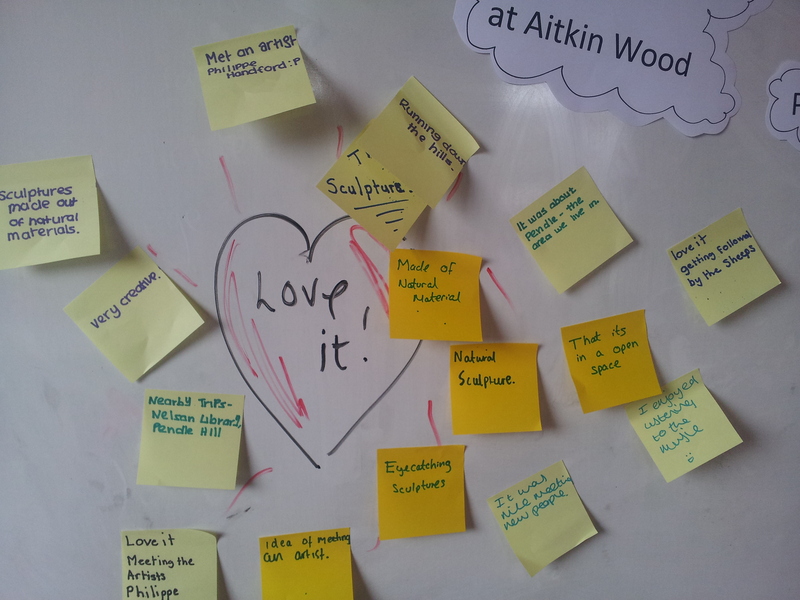 We followed a sculpture trail through Aitken Wood and Philippe Handford, the artist who made the sculptures, explained their meaning to us. We were involved in a project about the Pendle Witches and were learning more about the story and local beliefs about it. I liked the fact that the sculptures were different sizes and some were partly concealed up in the trees. The fact that it was outdoors gave it a natural mood, especially as the location fit in with the Pendle Witches. The art wasn’t very accessible and it was hard to see how some of the pieces linked to the witches. I would (recommend it to others) because we managed to enjoy it even though the weather was bad, which means in good weather it would probably be more enjoyable. (I learnt) that artists can use locally sourced materials to create sculptures that follow a theme, creating pieces of art work for people to interpret themselves about the witches. (I enjoyed) walking around the wood in the outdoors and observing the learning about different sculptures made by Philippe Handford inspired by the Pendle Witches trail and story. (I went to this event) because I wanted to learn more about the Pendle Witches and also to learn about art. I enjoyed looking at the sculpture of the falling tree as it was creative and made from natural materials. I didn’t like how some sculptures were hard to understand because I like art that tells a story and is interesting. I would recommend it to keen walkers or families as it is a pretty walk and are interested in history. I learnt that art can come from basically anything since before I associated art with paper and pain, now I know it can be more – just basic materials. We walked around Pendle Sculpture Trail. Philippe Handford gave us a tour of the trail. It was in Aitkin Wood and its theme was the Pendle Witches. I went to this event because I was very interested by the artwork was quite hard to understand. I liked some of the artwork because it was really cool. Some of the art was hard to understand and wasn’t relevant. I would recommend it but not all the art. I learnt that the council would pay Philippe to go into the woods and do that sort of thing. I went to the Paper Cut Exhibition at Manchester Art Gallery. There was a mixture of art ranging from sculptures like a motorbike and paper like maps made of money. I went to this event because it links to the projects we were doing in class. I liked the life-sized sculptures, different types of art and a man that was made only from books hanging from the ceiling. Some of the paper art were more obscure / difficult to understand. I would recommend it to others because it would appeal to a wide range of people. Young people involved in our Lost Legends project have been experiencing art, most recently by exploring a local sculpture trail. These images show our responses to the experience and now we want to share them with you. Please leave your comments as this will help the young people involved to achieve their Arts Awards at Bronze level. Since Autumn last year, MPA have been working with two groups of young people to explore the story of the Lancashire Witches. We have visited museums and heritage sites and met and talked to a range of heritage experts. As part of this adventure we have used the arts to think about and communicate what we have learned. The young people involved have worked with filmmakers Huckleberry Films, drama specialist Steve Fairclough and community artist Kerris Casey St Pierre to creatively retell the story of the witches. We discovered a tradition of artists drawing inspiration from this legendary story and we visited Aitkin Wood with artist Philippe Handford to explore the Pendle Sculpture Trail inspired by the witch trials of 1612. 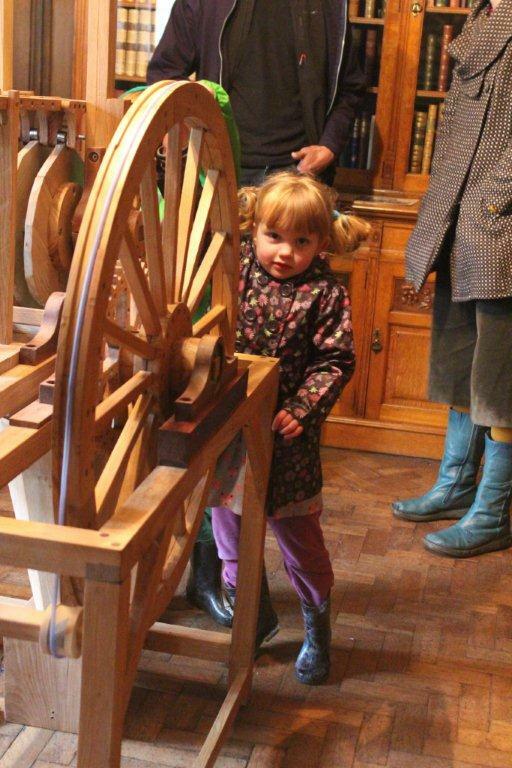 Being part of the Lancashire’s Lost Legends project has introduced young people to creative practitioners, led them to develop their own artistic skills and allowed them to experience arts events and exhibition such as the Pendle Sculpture Trail. Earlier this week, we reviewed our experience of the sculpture trail and now we want to share our review with you. 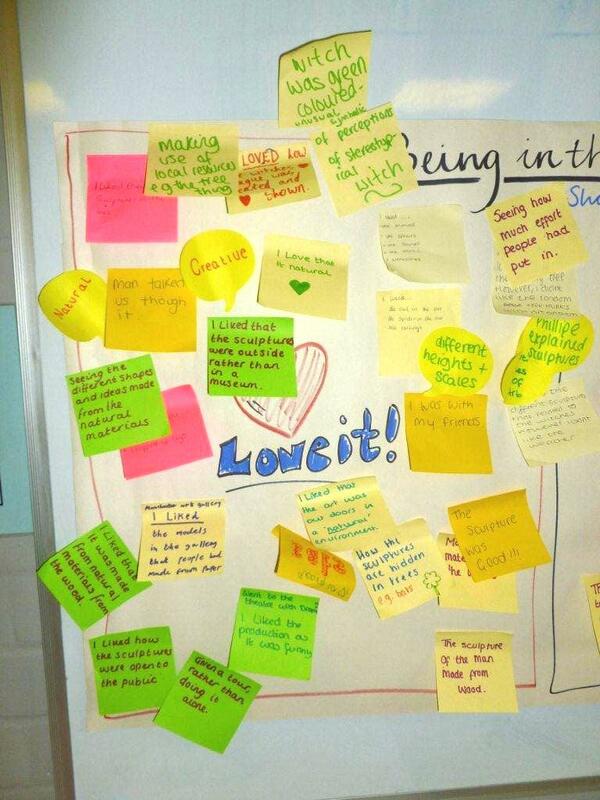 The photos above show the responses we generated and shared in school on Monday. We also wrote up our responses which we will share with you very soon. Please take a moment to let us know what you think after reading our comments.